I watched this cute story @ YouTube. I like it very much and I would like to share with you all. Once upon a time, a merchant and his crews was sailing his cargo-ship across the ocean. Suddenly they saw a beautiful celestial castle, they anchored the ship near the castle. Inside the castle they saw a pretty angel with beautiful long black hair sitting there all alone. The angel told the merchant and his crews not to come close because she had no clothes on. The merchant wanted to offer her precious Kasi-clothes; but she denied the offer, saying that it was because of her past evil deeds, she only had to cover her body with her long black hair. However, she suggested that the merchant give the clothes to a Buddhist devotee upasaka and ask him to donate merits to her; only then she could receive the merits. It happened that there was a crew on board who truly devoted to the Buddha, so the merchant did what the naked angel had advised. Then, like a miracle, the angel appeared to them with devine clothes, so stunningly beautiful! The angel then entrusted the merchant to pay homage to the Buddha, and to give some of her merit-devine-clothes, water, jewel and rice to the Buddha when they sailed back to Savatthi. After the long voyage, the merchant and his crews went to pay homage to the Buddha at Jetavanaram. They told him the strange event about the naked angel and her celestial castle in the middle of the ocean. The merchant gave the angel's devine gifts to the Buddha and asked him about her past evil deeds. Once she was born in Benares. Her beauty and pretty long black hair made her famous throughout the land. People made her a beauty queen with duty of carrying big bouquet of flowers in special ceremony events. One day, her best friend who secretly envied her so much, put poison herbs on her hair that caused her baldness. She was so ashamed of her look and ran away to a new town where she sold sesame-oil for a living. She was so poor that she did anything she could to make money. For example, she sold alcohol beverages to townsmen and stole their money, jewelry and clothes (left them naked) while they were drunk. She became richer. Then one day an old bhikkhu came for alms-food near her place. She was so happy to do merits; she gave delicious foods to the bhikkhu and made a wish that she had long beautiful black hair again. After her long life, she was now reborn as this naked angel. While residing at the Jetavana monastery, the Buddha uttered Verse (239) of this book, with reference to a Brahmin. Once, a Brahmin saw a group of bhikkhus rearranging their robes as they were preparing to enter the city for alms-food. While he was looking, he found that the robes of some of the bhikkhus touched the ground and got wet because of dew on the grass. So he cleared that patch of ground. The next day, he found that as the robes of the bhikkhus touched bare ground, the robes got dirty. So he covered that patch of ground with sand. Then again, he observed that the bhikkhus would sweat when the sun was shining and that they got wet when it was raining. So finally, he built a rest house for the bhikkhus at the place where they gathered before entering the city for alms-food. When the building was finished, he invited the Buddha and the bhikkhus for alms-food. The Brahmin explained to the Buddha how he had performed this meritorious deed step by step. To him the Buddha replied, "O Brahmin! The wise perform their acts of merit little by little and gradually and constantly they remove the impurities of moral defilements." Verse. Little by little, ever and anon, the wise man should remove his moral impurities as a smith blows away the dross of silver. At the end of the discourse the Brahmin attained Sotapatti Fruition. This story the Buddha told while dwelling in Jetavana, about Devadatta. supported his wife and child from the money he got by selling the mango-fruits. that the young man was a cheat and so no mantra would stay with him for long. to a baby and was confined to her bed for nearly a month. acknowledge that I was your Guru, then the mantra will vanish from your mind. low born man. So he replied that a great Sanskrit scholar taught him the mantra. only if he seeks his Guru's forgiveness, learns from him the forgotten mantra. himself to blame for forgetting the mantra. wishing that he had been loyal and truthful to his Guru. was the king, and I was the low caste man." their effort which has led to their final enlightenment. the Buddha, at the request of Candappajjota, to invite him to come to Ujjenii. explained that this was because Mahaa Kaccaana kept his senses well guarded. One may lie upon one's death bed." Deadly Love At First Sight!! as an etadagga who attained arahantship fastest among the bhikkhunis. Bhadda Kundalakesa: Deadly Love At First Sight!!! led to the place of execution. She fell in love with the thief at first sight. the thief escape and brought the thief home at night. revealed his plan of killing her for her money and jewelry, she was very angry. the side of the mountain to his death. the people called her Kundalakesa(curly hair). debates despite who challenged her. One day, Bhadda arrived in Savatti and created a sandpile to spark a debate. attention from all over and many crowds of people traveled for the debate. declined and told her she should see the Buddha. and was known as Kundalakesa Theri. than anyone else, Bhadda was the fastest among the bhikkhunis. king to kill his babyboy, but the king denied and even named the boy'Sattuka'. him walked around town for people to see before taking him to the place of execution. I learned about Doctor Jivaka, the Buddha's doctor , when I was young. His achievement truly impressed me so much that I wanted my only daughter to also become a doctor. I would like to dedicate this story to my dear daughter Dr. Sirikanya Sastri, MD .....a surgeon working for the US Air Force. At the time of the Buddha, among the lay physicians, the most renowned was Jivaka Kumarabhacca, who is described as providing free medical care to the Buddha and other monks and donating his mango grove at Rajagaha for use as a monastic community, named Jivakarama. Jivaka's fame as a healer was widely known and tales about his life and medical feats can be found in almost all versions of Buddhist scriptures. The Pali version began with Salavati, a courtesan of Rajagaha, giving birth to a son whom was then given to a slave woman, who placed him in a winnowing basket, which was left at a rubbish heap on the roadside. In the Sanskrit-Tibetan account, a promiscuous wife of a merchant from Rajagaha gave birth to a son of King Bimbisara, placed the infant in a chest, and ordered maidservants to set the chest at the gate of the king’s palace. In the Chinese narrative, a divine virgin named Arampali, who was raised by a Brahman, gave birth to a son of King Bimbisara. The boy was born with a bag of acupuncture needles in his hand and therefore was predestined to become a doctor and a royal physician. His mother wrapped him in white clothes and ordered a slave to take him to the king. In all versions, the infant is taken and raised by the king’s son 'Prince Abhaya'. In the Pali account, the boy is given the name Jivaka because he was alive (from root jiv, to live), and because a prince cared for him he is called Kumarabhacca (nourished by a prince). Concerning his interest in medicine and his medical education, in the Pali account, Jivaka, as he approached the age at which he must seek his own livelihood, decided to learn the medical craft. Hearing about a world-famous physician in Taxila, he travelled to that city, famous for education, to apprentice with the eminent doctor. After seven years of medical study, he took a practical examination that tested his knowledge of medical herbs, passed with extraordinary success, and, with the blessings of mentor, went off to practice medicine. In the Sanskrit-Tibetan version, Jivaka desired to learn a craft. Seeing white-clad physicians, he decided to become a doctor and studied the art of healing. After acquiring the basics of medicine, he wished to increase his understanding by learning the art of opening skulls from Atreya , the king of physicians, who lived in the city of Taxila. So Jivaka went there, took the practical examination on medical herbs and performed other healings, and so deepened his knowledge of medicine that he could even advise his master on therapeutic procedures, thereby earning the latter’s respect. Pleased with Jivaka depth of understanding, Atreya communicated to him the special technique of opening the skull. Jivaka eventually left the company of Atreya and journeyed to the city Bhadrankata in Vidarbha, where he studied the textbook called “The Sounds of All Beings” (most probably a textbook related with the practice of dharanis and mantras). During his travels, he purchased a load of wood from a thin and feeble man and discovered in the woodpile a gem called “the soothing remedy of all beings"(The Bodhisattvas of Healing). This gem, when placed before a patient, illuminated his inside as a lamp light up a house, revealing the nature of illness. In the Chinese version Jivaka relinquished all claims to the throne and studied medicine. He found that the education he acquired from local physicians was inadequate and showed their deficiencies in the knowledge presented in the textbooks on plants, medical recipes, acupuncture, and pulse lore, which he had successfully mastered. He therefore instructed them in the essential principles of medicine and gained their respect. Hearing of a famous physician, Atreya, who lived in Taxila, he traveled to the city to learn medicine from him. After studying medicine for seven years, he took the practical examination on medical herbs and passed it with great success. When Jivaka departed, his master told him that, although he himself was first among the Indian physicians, after his death, Jivaka would become his successor. On his travels, Jivaka encountered a young boy carrying firewood and found he was able to see the inside of the boy’s body. Immediately realizing that the bundle of wood must contain a piece of the tree of the King of Healing, who, according to early Mahayana scriptures, is a Bodhisattva of healing, he bought the wood, discovered a twig of the auspicious tree, and used it to diagnose illnesses in the course of his famous medical practice. Jivaka is regarded as the Father of Medicine, a source of knowledge about the healing powers of plant, mineral, massage and so forth. His teachings travel to Thailand at the same time as Buddhism. Definitively a central figure in the Buddhist medical system, he is legitimately regarded as the aspiration for all practitioners of Ancient Massage. Jivaka became a disciple of the Buddha and would treat him and any monks or nuns when they became sick. He had a beautiful mango garden just outside the east gate of Rajagaha which he donated to the Buddha and which later developed into a large monastery. The remains of this monastery were discovered in 1954 and excavated by archaeologists. The Buddha delivered two discourses to Jivaka. In the first he gave the conditions under which monks and nuns can eat meat and in the second he defined a lay disciple as one who has taken the Three Refuges and who observes the five Precepts. After the discourses, Jivaka attained sotapatti fruition. Because of the dedicated attentive care with which he ministered to his patients, the Buddha praised Jivaka as an etadagga amongst his disciples who were "loved by the people". Realizing that Jivaka’s education was complete, Disapamok asked him to go forth and bring back a plant, herb or root that could not be used for medicinal purposes for the preservation of life. After travelling far and wide Jivaka returned to his teacher to inform him that no such plant, herb, or root existed. All of nature’s treasures were beneficial for the preservation of life. The joyous teacher then praised his pupil by informing him that his education was complete. Jivaka had surpassed his teacher in knowledge. Jivaka decided to go back to Rajagaha to his adoptive father. On the way he stopped to rest in a city named Saletha. He soon heard that the young daughter of the city’s wealthiest nobleman was sick. Despite the ministering of many well-known physicians, she had suffered from severe headaches for seven years. Jivaka approached the nobleman, as he was confident that he could cure the maiden. The maiden, however, was not impressed by the very young man who claimed he could cure her when older, well-known physicians had failed. Offering his services for free, Jivaka continued to declare boldly that he could cure her. Gathering herbs and roots, Jivaka prepared the medicine which he then administered to her through her nostrils. Before long the maiden’s headaches disappeared. The grateful nobleman showered Jivaka with gifts and gold and provided him with a golden chariot. Jivaka approached Prince Abhaya’s palace in great style. Handing over his newly earned wealth to his adoptive father, Jivaka thanked him for his love, compassion, and caring. Prince Abhaya, however, returned all the wealth to Jivaka and informed him that he owed him naught as he was his true son and heir. He then told him that during his absence he had found out the full story of his origin. His mother, Salawathi, was the sought-after courtesan of the kings and nobility. Wanting to retain her freedom, she had discarded the baby whom she felt would be a burden to her. Prince Abhaya had unknowingly adopted his own child as he had loved his son dearly even prior to knowing that he was in fact his own child. Prince Abhaya built a palace to serve as Jivaka’s residence and provided him with many servants. Jivaka’s second patient was none other than his own grandfather, King Bimbisara. The king had a huge growth in his stomach that bled from time to time on his royal robe. So prominent was the growth that his consorts had started to tease the king by saying that he was with child. The king had been treated by all the great physicians of the country to no avail. Prince Abhaya informed Jivaka of his grandfather’s plight. Diagnosing the disease sight unseen, Jivaka immediately prepared the suitable medicine. Then hiding it on his person, he visited the king. After examining the king he administered the medicine that he had brought with him. Before long the king’s growth shrank and his wound healed. The grateful king called his entourage of five hundred consorts who had teased him unmercifully by asking if his first-born was to be a boy or a girl, and commanded them to give all their jewellery as a gift to Jivaka. Before long a mound of precious jewellery higher than Jivaka himself was placed at his feet. However, Jivaka refused this payment and requested permission from the king to return the ornaments back to his consorts. Even more impressed by Jivaka’s deportment, the king showered him with wealth, gifted him with the royal mango grove and made him the royal physician. Jivaka built a monastery in his mango grove so that he could be close to the Buddha when attending to His needs. It was Jivaka who attended to the Buddha’s foot when it was cut by the sliver of rock that Devadatta rolled down the hill at Gijjhakuta. It was also Jivaka who treated the Buddha in His last days, when He was overcome by stomach pains. May your daughter become a physician as kind and wise as Jivaka! May she bring care, love and solace to many living beings! from the eight usual causes of a great earthquake. by no common effort, O king, that the great earth is moved. 68. D. ii. 107; A iv. 312. 69. DhA. ii. 40f, Dhp. v 68. 70. DhA. iii. 1, Dhp. v 116. This beautiful Tuesday I proudly present the great love jataka of Vessantara And Maddi. The lineage of the Sivis is best known for its charity and sacrifices in the Indian traditions since time immemorial. Once, the Bodhisatta was born as Vessantara (Sanskrit: Vishvantara) in the dynasty of the Sivi in the kingdom of Jetuttara. 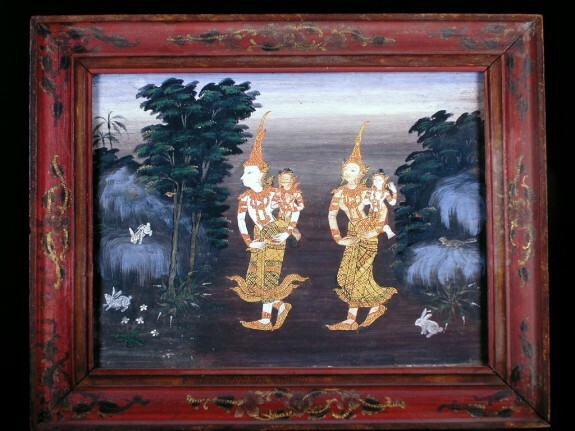 King Sanjaya was his father; and Queen Phusati was his mother. He appeared to be a child prodigy because he spoke on the very day when he was born. Interestingly, on the same day a white elephant was also born. This elephant, who was given the name Pacchaya, was gifted with the supernatural power to make the rain fall. Vessantara’s passion for charity was so intense that the earth trembled when he pledged to make a great gift at the young age of eight. At sixteen he married Maddi (Sanskrit: Madri). He had two children: Jali and Kanhajina. At that time there was a great draught in Kalinga. So, eight Brahmins from Kalinga came to Vessantara to beg for his white elephant to make the rain fall in their country. Vessantara acceded to their request and donated the elephant. When the people of Jetuttara heard of this news they were terribly disturbed. Agitatingly, they went to the king and asked him to punish the prince by banishing him to the forest of Vankagiri. The will of the people eventually prevailed and Vessantara had to go on exile much to the unwillingness of the king. Before setting out he obtained the king’s consent to hold an alms-giving ceremony called the “Gifts of Seven Hundreds (Sattasataka). On the occasion he gave away seven hundred pieces of seven hundred kinds of things to the needy people. When Vessantara took leave of his parents and was preparing to depart, his wife Maddi insisted to accompany him with her children Jali and Kanhajina. I call this to be your influence. When they were thus involved in the pleasant conversation they encountered one more brahmin beggar, who begged for the carriage. So, Vessantara had to part with his carriage, too. He then lifted his son Jali in his arms, and Maddi lifted Kanhanjana; and thus they continued their jouney on foot. The sun was scorching. So, The cloud overspread overhead to act as a canopy. The trees extended their branches to offer them delicious fruits as an offering to their virtue of charity. 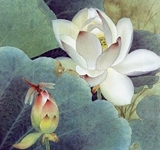 When they longed for water the lotus ponds appeared before them to quench their thirst. Further, the yakkhas shortened their path to protect them from exertion. Thus, treading through Suvannagiritala, Kantimara, Mount Aranjagiri, Dunnivittha, the capital of Cheta (where his uncle ruled), Gandhamadana, the foot of Mount Vipula to the river Ketumati (where a forester offered them food) and then by crossing the river Nalika along the bank of lake Muchalinda and further crossing a dense forest they finally reached Vankagiri. Vissakamma, the Engineer of Sakka had already built two hermitages for them in the forest. One was for Vessantara and the other was for the rest of the family. The power of Vessantara was so strong that no wild animal came near their hermitages. Happily, they spent four months. Whose little ones are killed. But finds the hermitage empty. Give half to mother to assuage her grief." When Maddi returned late in the evening and did not find her children around, she asked Vessantara of their whereabouts. But Vessantara kept silence. She then repeated the same question several times, yet Vessantara did not utter a single word. So, she again went inside the forest and looked for the children for whole night. Next morning, when she returned she fainted. Vessentara then helped her regain consciousness. That was the time he apprised her of the whereabouts of the children and narrated the story. By then Maddi had mustered up the courage to endure the trauma. Surprisingly, she praised Vessantara’s great act of dana-sila (Conduct of charity). Their sacrifice trembled the earth. And so did mount Sineru with all its resplendent gems. Surprised, Sakka, the lord of the devas inquired into the cause. When he learnt the cause of the quakes owing to the sacrifice of Vessantara he visited the hermitage next morning to test the firmity of his vow in the guise of a mendicant and begged him for his wife. Even then Vessantara did not lose the firmness of his mind and nodded to donate Maddi as well. Besides, no anger sprang even in the heart of Maddi. She did not wail. She rather looked stupefied and stood like a statue with her eyes fixed on her husband with a fresh load of suffering. Can there be a greater exemplification of magnanimity?" Now, it was the time for Sakka to reveal his identity. He gave Maddi back to Vessantara. Furthermore, he offered eight boons to the great donor, which included the reunion of his family; his recall to the father’s kingdom; and his ability to benefaction. In the meanwhile, Jujaka had traveled sixty leagues and having lost his way he reached Jetuttara, though he intended to reach Kalinga. His rugged appearance and harsh behaviour with the two delicate children attracted the royal guards, who brought him before the king. King Sanjaya, when saw his grand-children and learnt their story he bought them back from the cruel brahmin in lieu of handsome gifts and seven-storeyed palace. But Jujaka could hardly enjoy those riches as he died of over-eating in a few days. The king along with Phusati, Jali and his army then marched to Vankagiri to bring back his son and the daughter-in-law. The white elephant Pacchaya also joined the procession as he had just returned from Kalinga as no one could subdue him there. Finally, after a month of merry-making in the forest they all returned to the kingdom, happily. (Devadatta is identified with Jujaka and his wife Amittapana as Chincha; Sanjaya as Suddhodhana and Phusati as Mahamaya; Rahula with Jali, Uppalavanna as Kanhajina, Rahulamata as Maddi; and Vessantara as the Bodhisatta). time of the Buddha Dipankara. I love this story very, very much. Siddhattha's cousins. Yasodhara was born on the same day as Prince Siddhattha. cousin, Yasodhara, to be His bride. however, wanted to marry no one else but Siddhattha. consort and helpmate and to support Him actively in His quest for Buddhahood. the virtues she actively supported His quest for perfection. other Buddhas take eight and sixteen infinite periods to achieve. on His feet and paid reverence to Him as she wished. she did not even look at a single one." to the Bodhisattva when he aspired to attain enlightenment, the highest aim of mankind. would be a balm that will miraculously transform all sorrows into heavenly joy. and Bakkula. She expressed her desire for this achievement in the time of Padumuttara Buddha. Yasodhara Theri passed away at the age of 78, prior to the Lord Buddha. She joined the Order under Pajápatí Gotamí in the company of Janapadakalyání (Nandá), and in the Order she was known as Bhaddakaccáná Therí. Later, she developed insight and became an arahant. She could, with one effort, recall one asankheyya and one hundred thousand kappas (AA.i.205). The Apadána account mentions how, just before her death, at the age of seventy eight(two years before Buddha's Parinibbāna), she took leave of the Buddha and performed various miracles. It also states that eighteen thousand arahants bhikkhunis, companions of Yasodhará, also died on the same day. Yasodhara was once, after becoming a bhikkhuni, ill from flatulence. When Ráhula, as was his custom, came to visit her, he was told that he could not see her, but that, when she had suffered from the same trouble at home, she had been cured by mango juice with sugar. Ráhula reported the matter to his preceptor, Sáriputta, who obtained the mango juice from Pasenadi. When Pasenadi discovered why the mango juice had been needed, he arranged that from that day it should be regularly supplied. The Játaka relates how, in a past birth too, Sáriputta had come to Ráhulamátá's rescue. *The Supatta Játaka, where Sáriputta, at Ráhula's request, obtained for her from Pasenadi rice with ghee, flavoured with red fish. This was for abdominal pain. in the time of Dípankara Buddha, when the Bodhisatta was born as Sumedha, she was a brahmin maiden, Sumittá by name. One day, while waiting in the city of Paduma for the Buddha Dipankara, Sumedha tried to buy flowers as an offering to the Enlightened One, but soon learned that the king already bought all the flowers for his own offering. Yet, as Dipankara was approaching, Sumedha spotted a girl named Sumitta holding eight lotuses in her hands. He spoke to her with the intention of buying one of her flowers, but she gave him all of the lotuses, which he, in turn, offered to the Buddha. Dípankara, in declaring that Sumedha would ultimately become the future Buddha Gautama, added that Sumittá would be his companion in several lives. The meaning of the name Yasodhara (Sanskrit) [from yasas "glory, splendor" + dhara "bearing" from the verbal root dhri "to bear, support"] is Bearer of glory. The names she has been called besides Yashodhara are: Yashodhara Theri (doyenne Yashodhara), Bimbadevi, Bhaddakaccana and Rahulamata (mother of Rahula). In the Pali Canon, the name Yasodharā is not found; there are two references to Bhaddakaccānā. The Question : Perfection of the Buddha? that he follows the practice of seclusion. months, but there was an occasion when the Buddha spent three months in solitude. cf. Commentary to Dhp. v 6. This Uposatha Day, as a person who loves lotus flowers very much, I proudly present the beautiful story of Padumuttara Buddha. After the age of Narada Buddha about one eon and one hundred thousand millions years, there was a Buddha named Padumuttara. There was no other religious in his age, so all humans and all gods respected in Padummuttara Buddha. Padumuttara Buddha is the thirteenth in the List of the 28 Buddhas. Padumuttara was born in Hamsavatī, of the khattiya Ananda and his wife Sujātā. At the moments of his birth and his Enlightenment, a shower of lotuses fell in the ten thousand worlds, hence his name. He lived as a householder for ten thousand years in three palaces: Naravāhana, Yassa (or Yasavatī) and Vasavatti. His wife was Vasudattā, by whom he had a son, Uttara (according to SNA.i.341, his son was Uparevata). He left home in his palace (Vasavatti), and practised austerities only for seven days. A maiden of Ujjeni, called Rucinandā, gave him milk rice, and the ājīvaka Sumitta gave him grass for his seat. His bodhi tree was a salala, under which he spent a week, and when he touched the ground with his foot, huge lotus flowers sprang out of the earth, covering his body completely with their pollen. (The Samyuttabhānakas give this as the reason for his name.) His first sermon was preached to his cousins Devala and Sujāta, who later became his chief disciples. The spot where the sermon was preached was Mithiluyyāna. Sumana was Padumuttara's personal attendant, Amitā and Asamā his chief women disciples, Vitinna and Tissa his chief patrons among men, and Hatthā and Vicittā among women. His body was fifty eight cubits high, and his aura spread for twelve yojanas. He died in Nandārāma at the age of one hundred thousand, and a thūpa twelve leagues in height was erected over his relics. Our most recent Buddha, Gautama Buddha, was a hermit named Maharattiya. He offered robes to Padumuttara Buddha and monks and was fortold that he would be Gautama Buddha in the future. I truly love this supercute Rahula story...just imagine a little 7 yrs old prince followed his father"The Buddha" everywhere and was ordained by Sariputta Thera himself... cute samanera Rahula ...how wonderful !! (Yasodhara) sent the boy to the Buddha to ask for his inheritance (dayajja). The Buddha gave him no answer, and, at the conclusion of the meal,left the palace. and to this the Buddha agreed. those of his disciples who were anxious for training (sikkhaakaamaanam). Buddha and even Sariputta, and the place of his death is given as Tavatimsa. For twelve years he never lay on a bed. (DA.iii.736). hundreds of thousands of years they are not destroyed. This foggy Saturday with tears in my eyes, I proudly present a very touching story that might make you all cry too. But please have a happy day! Once upon a time, there was a young daughter of a rich family who lived in Rajagaha City. She admired Buddha's teachings and loved to listen to his dhamma talks. Her heart was committed to joining the Buddha's Sangha Order, but her parents wanted a different life for her. They chose to marry her to a rich young man. As an obedient daughter, she complied with the parents' wish. After having entered the matrimony for a while, she begged her husband to let her join the Sangha Order. Her husband finally gave her his blessings to become member of Buddha's Order. Thus she was ordained as a bhikkhuni and resided with lady-monks under Bhikkhu Devadatta. Months passed by, one day the lady-monks of the community noticed that the new bhikkhuni was pregnant. They furiously disapproved of her and wanted her to be forced out of the Order. So they brought the case to Bhikkhu Devadatta who agreed that she must quit the Order. The young lady, however, argued that the Buddha should be the one to judge her and decide if she whether or not should be banished from the Order. After an intensive investigation by Upali Thera, the Buddha was counseled that the conception of her baby occurred prior to her joining the Order. Thus they concluded that she must not to be blamed or had to disrobe. This pregnancy case was so famous that even King Pasenadi and Upasika Visakha got involved. After the bhikkhuni had given birth to a baby boy at the monastery, King Pasenadi adopted the baby and raised him as his own child in the royal palace. The babyboy was given the name 'Kumara-Kassapa'. The boy grew up and played happily with other royal children. But one day the other children were no longer friendly; they ridiculed him, mocking him for being an orphan --not a royal blood sibling. And it made him very sad and desolated. He was only seven years old then, when he went to see the Buddha and asked to be ordained as a samanera and to reside at the Buddha's place. Kumara Kassapa then travelled days and nights to see the Buddha and delivered the Deva's 15 questions. While Buddha was telling him the answers to all these questions one by one, Bhikkhu Kumara-Kassapa listened intensely to each answer such that he attained arahantship with the Four Patisambhida -- right at the end of the question #15! Once there was a very learned prince named 'Payasi of Setavya' whose stubbornness and arrogance was well known throughout the city. But after meeting with and debating about his belief with Kumara-Kassapa, Payasi admitted in public that he was wrong in every category. He was so impressed with Kumara-Kassapa's Dhamma that he proclaimed himself a royal supporter of the Buddha and his monks from then on. Because of Kumara-Kassapa's keen knowledge of the Dhamma and his great skills in delivering it, the Buddha praised him as an "etadagga" who was foremost among those with the special gift of delivering varied and versatile discourses (cittakathikanam). NOTE**: The mother of Bhikkhu Kumara-Kassapa was broken-hearted because King Pasenadi took her baby away to raise in his palace. She truly missed her kid through all those years and always wished that she could meet him again someday. Her wish came true one day, when she suddenly saw bhikkhu Kumara-Kassapa walking by for alms food! She was immensely happy, running to him so fast that she stumbled and fell to the ground in front of him. Bhikkhu Kumara-Kassapa realized that his mother was capable of enlightenment, but her overwhelming love has prevented her from unworldly attainments, therefore he intended to help her overcoming the worthless worldly love. So, instead of showing love and gladness, he criticized his mother that despite of her having been a bhikkhuni for quite a long time, it was shameful that she still could not let go of the wordly attachment. The ruse succeeded; his words cut through her heart like a knife. She suffered so deeply that she walked away from him and went back to the monastery. She then meditated continuously, nonstop, and was able to attain arahantship that very night. NOTE: In the time of Padumuttara Buddha Kassapa was a learned brahmin, and having heard a monk ranked foremost in eloquence, he wished for a similar distinction and did many good deeds and merits towards the end. NOTE: The superdeva was a deity of the Suddhávása brahma world. He was one of five friends who, in the time of Kassapa Buddha, had entered the Order and who, in order to meditate uninterruptedly, had climbed a rock by means of a ladder which they had then removed, thus cutting off their return. The eldest became an arahant in three days, the second (anuthera) was this superdeva, who had become an anágámí. The third was Pukkusáti, the fourth Báhiya Dárucíriya and the last Kumára-Kassapa. This superdeva was responsible for the arahantship both of Báhiya and Kumara-Kassapa.